Anyone who knows me knows I am an absolute F&B die hard fan. I love the colours, the quality of the paint, the finish, the branding...just everything, really. They are always my go-to paint brand and I've recommended them to everyone over the years; so to be asked to be involved with the marketing of the new papers has made me feel completely humbled and completely honoured, to be honest. It's my interior blogger 'big win'. When I got the new catalogue through my letterbox and saw my board and name in there I don't think I've ever felt a bigger sense of achievement! When I received this beautiful blue paper from F&B a few months ago, I imagined it on the walls of my home. If I did have it on the walls, what fabrics and colours would I pair it with? This is how I built my mood board up. I knew with a paper like this I'd opt for luxurious, deep navy furniture. 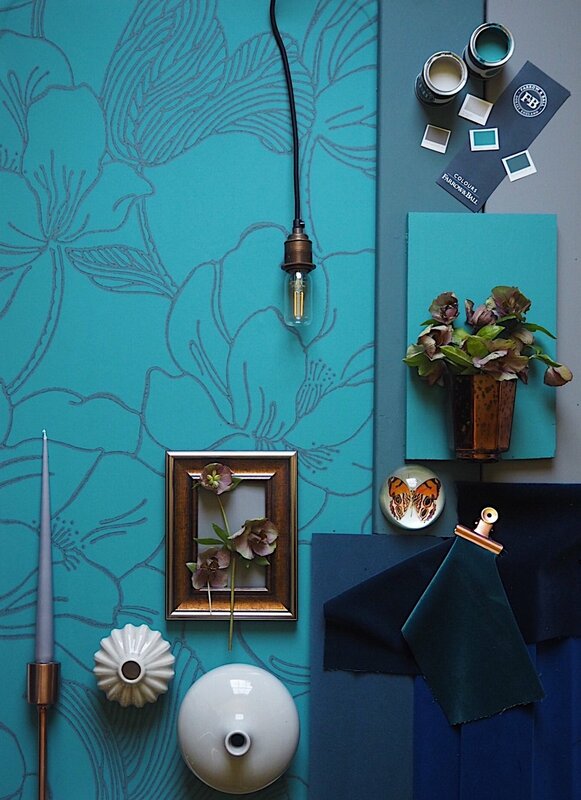 I'd keep the accessories to a complimentary palette of copper and grey, and leave the wallpaper to do the talking. I ordered some velvet fabric samples to feature on the board, and whizzed round my house looking for items in a muted copper! So anyway, enough about me and my mood board, lets check out these new wallpapers shall we? There are three new paper designs available in a multitude of colourways - Hegemone, Atacama and Helleborus. Each of the three designs are floral based, and take inspiration from the current trends of texture, maximalism and returning to nature. 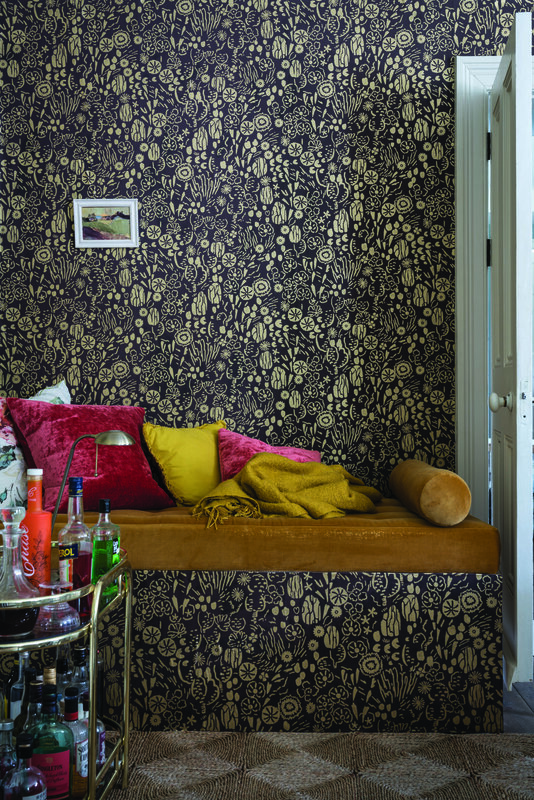 Hegemone is a erratic, fast-paced print with the floral design shooting off in different directions, so the flowers look they are scaling the walls like a climber within your interior. I love F&B blues, having painted most of my home in Dix Blue, Hague Blue, Railings and Oval Room Blue, so I think combining them within the Hegemone paper, as above, looks so striking. Isn't it such a stunner???? It is actually the largest motif in the F&B collection, and makes such an impact. I was also delighted that the stylist had paired this design with blue velvet, like I had for my moodboard, as the F&B press pictures are always so unbelievely gorgeous. These three new designs are available in seven colourways and are available to purchase as of today! I'd like to thank Farrow & Ball for giving me the opportunity to be part of this F&B history! I am delighted!!! What do you think to the new papers? What is your favourite design? Let me know in the comments section below! Want to hear about new collections first? Sign up to get it sent to your inbox!